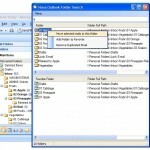 I will introduce best 5 free Add-in and utilities for Microsoft Outlook. Microsoft Oulook Plug-in Xobni is one of the best Free Add-ins that provides various useful functionalities. It organizes all data based on a person’s profile showing all the email conversations and the list of attachments and even extracts contact numbers from the email signatures. Of course, it is not always 100% accurrate but very impressive. There are other functions such as Facebook feeds and Linked-in integration. It is very useful and powerful add-in. If you have many emails and can’t find it but you know who sent it, Xobni is the answer. Have you ever get tired of the slow and bulky Outlook Inbox folder? 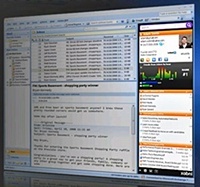 Your Inbox is too big that the Outlooks is so sluggish and crashes all the time. It’s time to reduce the size of your Outlook data file. But how? You don’t want to go through all the emails and delete the files one by one! will make Outlook run faster again. Make sure to compact the PST files after doing this to reduce the file size! Are you a fan of Outlook Calendar? Then you might want to try ‘Outlook on the Desktop’. 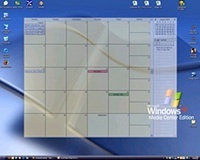 It shows Outlook Calendar in the Desktop screen providing easy access to the entries. You can edit and drop files directly on it just like the Outlook. 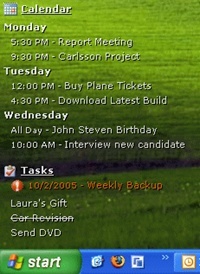 Similar to Outlook on the Desktop, DeskTask shows Calender appointments and Task items on the Desktop but as list. This is just to view only, unable to modify the entries from the Desktop. But clean and simple. You can use ‘Win+D’ key to see the Desktop easily by minizing all the active windows. Of course, if you are using Outlook Calendar and other hand-held portable devices, there is high chance that you also use Google Calendar. 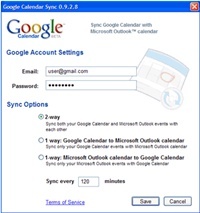 And this sync utility from Google is a must to have to sync data between Outlook and Google Calendar. You can control sync from the Windows Tray Icon. Simple and Nice. There must be more good free utilities out there. As soon as I find them I will make sure update this list. Total Workday Control Using Microsoft Outlook is a book for the over-extended office worker whose workday feels out of control. Thank you for visiting Hana & Sarah’s Freeware Blog. At work, I spend much of the time reading Emails using Outlook. And I try to keep a clean Inbox, moving emails various folders. But now that I have more than 500 folders, it gets confusing and taking more time to find the correct folder to categorize the email. 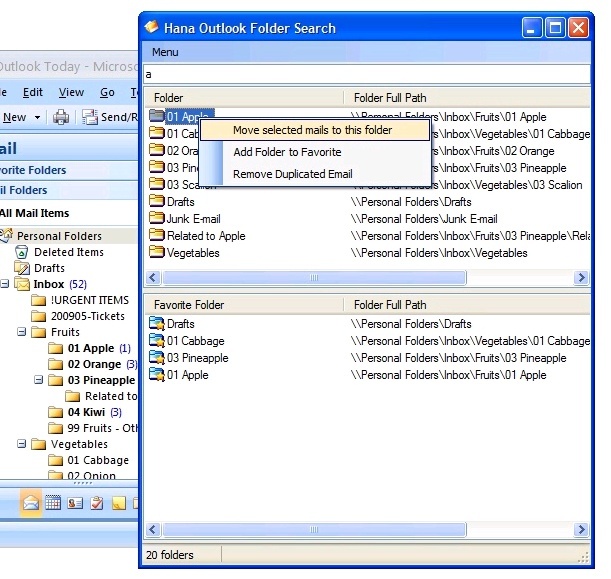 And after lots of headache and Internet surfing, I developed this utility ‘Hana Outlook Folder Search’ (HOFS). Basically you can type in any letters of the folder name that you can vaguely remember and it will show all the folders that contain the letters. And I decided to take one step further and implemented Duplicate Email Removal function. I do receive lots of duplicated emails since I use group email at work, and I always didn’t like opening emails and realizing they are duplicated. So HOFS can automatically remove the duplicated emails or I can run the removal task on any email folder manually. But since it was made using C#, you need Dot Net 2.0 installed prior running the setup file. Please try and let me know what you think. Dot Net 2.0 must be already installed. 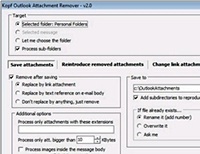 Microsoft Outlook 2003 and 2007 ( May not work with the previous versions).